Health systems and managed health care are inventions of the early 20th century, but it wasn’t until the early 1970s that Health Maintenance Organizations (HMOs) were defined as such and considered solutions for dangerously high healthcare costs. Although prevalent throughout the 1980s and 90s, HMOs for various reasons have declined in popularity. Today, once again the need for healthcare reform has become a high priority in the United States, and this time around Accountable Care Organizations (ACOs) have emerged as the improved versions of HMOs, but critics wonder if anything has really changed. The term HMO was introduced in the era of President Nixon with the passing of the Health Maintenance Organization Act of 1973. It took over a decade for this version of managed care to really gain momentum, but the HMO Act of ‘73 encouraged the creation of hundreds of HMOs that would cover millions of Americans through the late 1990s. By definition, HMOs were constructed as an “alternative to existing fee-for-service medical care” bringing together a “comprehensive range of medical or health care services in a single organization.” HMOs would provide these services “as needed to their subscribers in return for a fixed monthly or annual payment periodically determined and paid in advance” (Mueller). In other words, HMOs were, and still are, programs that provide health care to a defined population for a fixed price. In addition, they are designed for medical groups to coordinate care, share records and resources, assume full financial risk, account for quality and health outcomes, report data, and most importantly reduce costs. 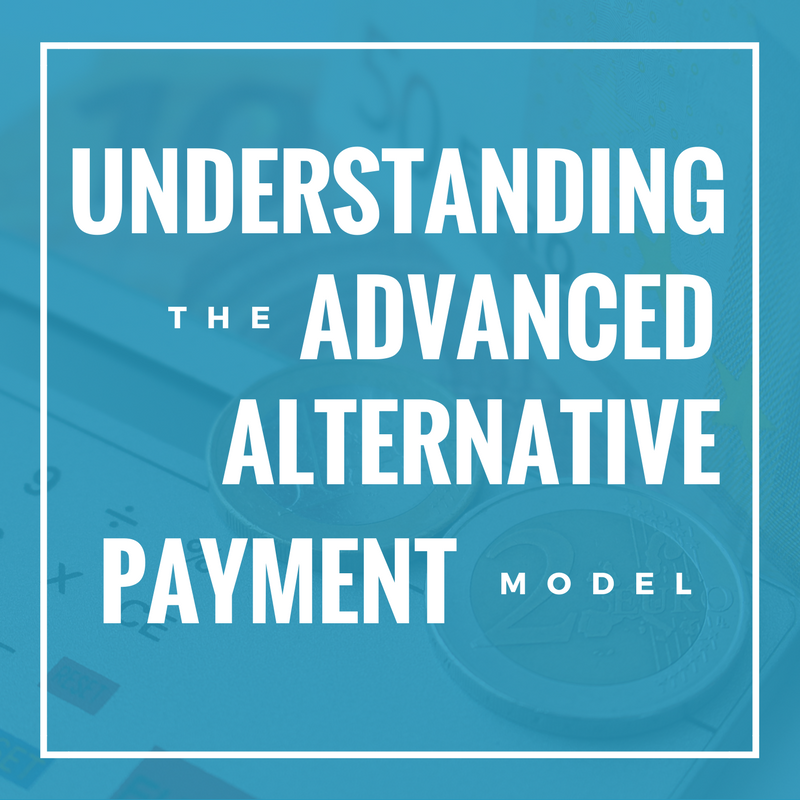 Recommended Reading "Understanding The Advanced Alternative Payment Model"
Accountable Care Organizations are a network of physician groups, specialists, surgeons, pharmacists, care managers, doctors and hospitals who agree to coordinate care for a patient population, with the goal of improving quality care, while eliminating unnecessary spending. ACOs associate payment for health care directly to the quality of care provided, rewarding care providers for delivering high quality, efficient clinical care. In 2011, the Centers for Medicare and Medicaid Services (CMS) began setting up their own “Pioneer ACO’s” across the country to accommodate Medicare patients, and through the Medicare Shared Shavings Program (MSSP) CMS incentivized private insurers to do the same. 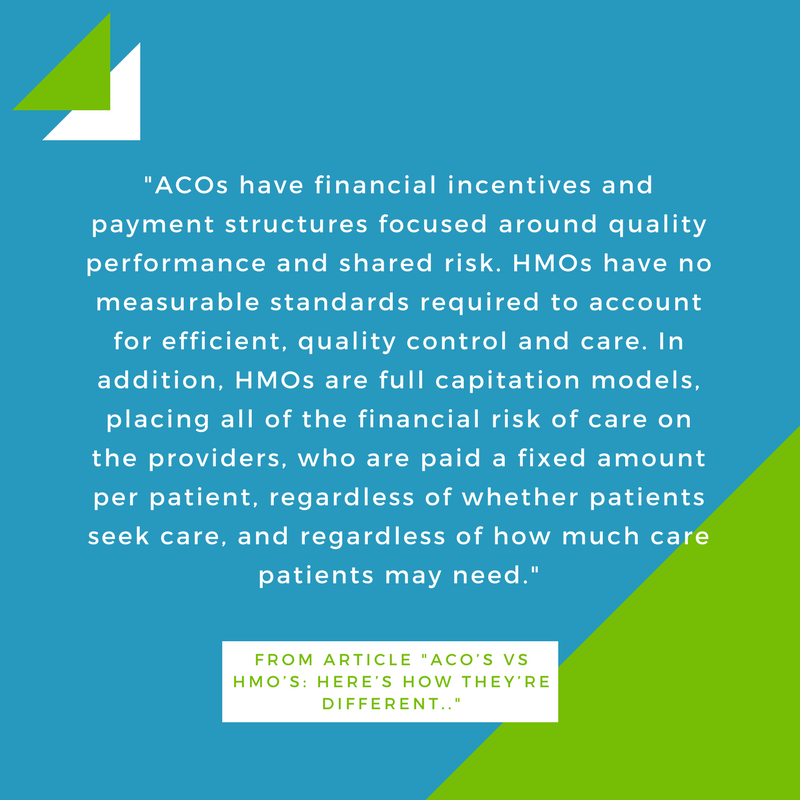 ACOs look very similar to their HMO counterparts, and they are designed to accomplish many of the same goals; however, they differ from HMOs in some very important ways. It’s been said that ACOs are HMOs on steroids, or in drag, or that they really are the same only with a few added bells and whistles. Well, all of these statements are true to an extent. As John McCracken, PhD points out, the foundation of both models “is provider accountability for care coordination and the ability to restrain an unsustainable cost trend. Providers are reimbursed on both their ability to generate efficiencies that reduce costs and to meet quality metrics”; however, most experts agree that ACOs are designed to take advantage of the historical benefits of HMOs while avoiding their drawbacks. First, ACO patients can move freely within, or outside of, the ACO integrated network. Participation is voluntary, and patients can choose any primary care physician (PCP), specialist, or hospital they want. HMOs are structured to be a controlled healthcare environment, with enrollment lock-in provisions, forcing patients to choose a network of doctors and hospitals for a minimum period of time. So, if patients are unhappy with the care they are getting, their options are limited to only those doctors enrolled in the HMO network. Furthermore, HMO enrollees are required to stay in network, but their doctors are not, so if their doctors drop out of network, enrollees cannot follow them, which disrupts continuity of care. ACOs have no enrollment lock-in provisions or network restrictions, so patients can seek care freely. Second, ACOs are not insurance companies—they are provider-led organizations. Joe Damore, Vice President of Population Health Management at Premier, Inc., explains that under the HMO model, “utilization review was developed, implemented, and controlled by the insurance companies…. In the accountable care model, it’s driven by the providers. There are no preapproval processes. The providers are developing their own appropriateness criteria” (Freeman). In the HMO model, insurance companies position primary care physicians as “gatekeepers” to control costs and patient care. PCPs oversee pre-authorizations and required referrals, thus controlling patient access to high-level care, tests, and hospitalizations. Insurance companies dictate to PCPs and patients what they can and cannot do, limiting benefits and choice of hospitals or specialists. Because ACOs are provider-led, primary care physicians are now the “quarterbacks,” coordinating care through an informed team approach with patients and other healthcare professionals to create a value-based, connected care environment. ACOs give providers freedom to implement “best practices” and to choose the most appropriate path to efficient, high-quality care. Finally, ACOs have financial incentives and payment structures focused around quality performance and shared risk. HMOs have no measurable standards required to account for efficient, quality control and care. Finally, ACOs have financial incentives and payment structures focused around quality performance and shared risk. HMOs have no measurable standards required to account for efficient, quality control and care. In addition, HMOs are full capitation models, placing all of the financial risk of care on the providers, who are paid a fixed amount per patient, regardless of whether patients seek care, and regardless of how much care patients may need. If patient care exceeds the pay-per-patient allocated, it’s the providers who lose money, not the insurers. Although capitation may incentivize better managed care, it does not incentivize quality care. This scenario leads to concerns that in the HMO model physicians may be influenced to provide less care than patients may require. ACOs offer a variety of payment structures, including hybrids of the traditional fee-for-service model, and most are structured to share financial risk between providers and insurers. Providers are incentivized with shared savings and bonuses when they successfully meet required performance measures focused on quality and cost of care, among others. ACOs are poised to make an undeniable, long-term impact in the healthcare landscape: they allow more freedom to physicians and patients to make appropriate healthcare decisions; they give authority to providers as the principal decision makers in effective care delivery; they share financial risk between insurers and providers; and they financially reward physicians for achieving performance standards in coordinated, cost-efficient quality care. In addition, ACOs have a tremendous advantage for success because they are evolving during a time where information technology systems are more sophisticated. Interoperability allows clinical and financial data to be exchanged in real-time, giving physicians and health organizations the ability to collaborate, to share information more effectively, and to achieve high quality, value-based care.